If we take a look at our church calendar, it becomes clear not only that the Lord’s Day is part of this Paschal remembrance, but also that every saint we commemorate on each day of the year takes us into the Mystery of Christ’s triumph over death by death. After all, each saint’s day is the remembrance of that particular saint’s death—which now, in the economy of Christ, has become that saint’s “birthday” into Christ’s Resurrection. Chief among the saints of the New Testament is the Mother of our Lord Jesus Christ, the Theotokos and Ever-Virgin Mary. For Orthodox believers, the Theotokos is no “afterthought.” She is the very flower of the Jewish people, the true descendant of Abraham by faith. St. Paul writes movingly of the drama of Christ’s appearing when he speaks of the Spirit overshadowing the Virgin Mary in his letter to the Galatians: “But when the fulness of the time was come, God sent forth his Son, made of a woman, made under the law, to redeem” us. With the Virgin Mary’s bold “yes” to God, the “time for the Lord to act” had arrived. Her body, consecrated to the Lord, would bear God Incarnate and become the fulfilment of the Ark of the Covenant. The Old Law, by her free consent, would be fulfilled by the New Law. Her womb–a finite space–would contain the infinite! The Orthodox Church teaches that when the Virgin Mary “fell asleep” (Greek kimesis or Latin dormitio), she did, in fact, die. The Church also teaches, however, that since she literally bore God in the flesh, her Son would not allow her body to see corruption. On the third day after her repose, the Church teaches, her Son sends angels to carry her body up into heaven; and, at the same time, He whom she cradled now cradles her in perfect love. In the arms of her Son, then, the Virgin Mary becomes the first fruit of those who will follow Jesus into the Resurrection. Her hope and glorification become now our hope and glorification! Her personal Pascha becomes the foretaste of our own Pascha, as well! Just as we approach Pascha with reverence and prepare our hearts for that glorious celebration, so too we eagerly await this “Summer Pascha.” As we look longingly towards the Feast of Dormition, we expect to encounter Life; but before we rush headlong into Life we must first taste of Death (following Christ’s pattern). Thus, we keep a strict two-week fast which begins, appropriately, with a feast of the Cross. 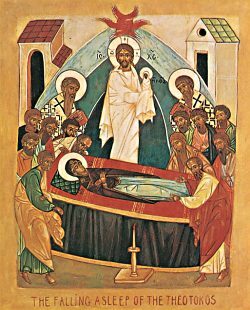 The Dormition Fast—within which we behold the glory of Christ’s Transfiguration on August 6th—leads us right into the Feast of the Dormition, which becomes for us the promise of the Resurrection and Life everlasting in Christ, with the Theotokos and all those who have learned to love Him.